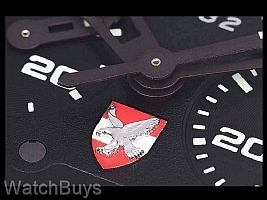 We've known about this project for some time, and are very pleased to present the first pieces of the new Hanhart Primus Austrian Air Force limited edition watch. This new watch pays tribute to Hanhart's decades-long tradition as a manufacturer of aviator chronographs. As early as the 1930's, pilots relied on Hanhart's expert knowledge of manufacturing aviator chronographs in the southern Black Forest of Germany, and that expertise continues to this day. In 2017, a structural change within the Austrian Army reestablished the official command of the Austrian Air Force, and this reorganization lead to the decision to design a limited edition watch together with Hanhart. This new chronograph is limited to only 100 pieces, and reflects the principles of the Austrian Air Force - precision, endurance and resilience. When combined with Hanhart's principles of reliability, extreme legibility, ease of use and a robust build quality, the result is an outstanding new timepiece. Take a look at the closeup image of the dial in our images above. Creating this dial became a focus of this project, as it carries the distinctive emblem of the Austrian Air Force at 6 - an eagle applied to the Austrian flag. You'll want to grab your loupe to see the intricate details such as feathers, claws and even the eagle's eyes. The dial is finished in black, with bright luminescent numerals, indices and hands to create a bold contrast. The large surface areas on both the dial and hands are heavily applied with SuperLuminova providing excellent visibility at night. This watch features the Hanhart bead blased case with articulating lugs which actually move to conform to the surface area of your wrist. 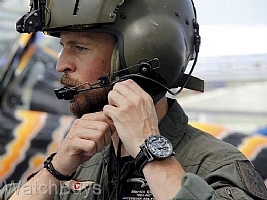 This is the same case as used on one of Hanhart's best selling watches - the Hanhart Primus Pilot Desert Sand, and is extremely comfortable to wear. The design of the Hanhart Primus Austrian Air Force limited edition watch combines Hanhart's 130 year watchmaking tradition with modern elements. To build this chronograph bicompax movement (Hanhart calibre HAN3809), Hanhart starts with a Valjoux 7750 and then creates movement modifications to achieve the bicompax display and functions. These modifications have been carried out under the direction of Manufacture La Joux-Perret, and also include adjusting the registers to correctly and proportionally fit the size of the dial (rather than the "pinched look" seen in other chronograph watches of this size). 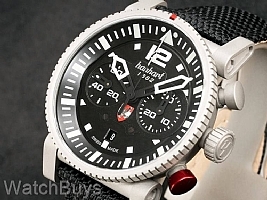 This new chronograph, like the entire collection, features Hanhart's distinctive trademarks, including the red push button developed as a warning to pilots for the chronograph reset function. 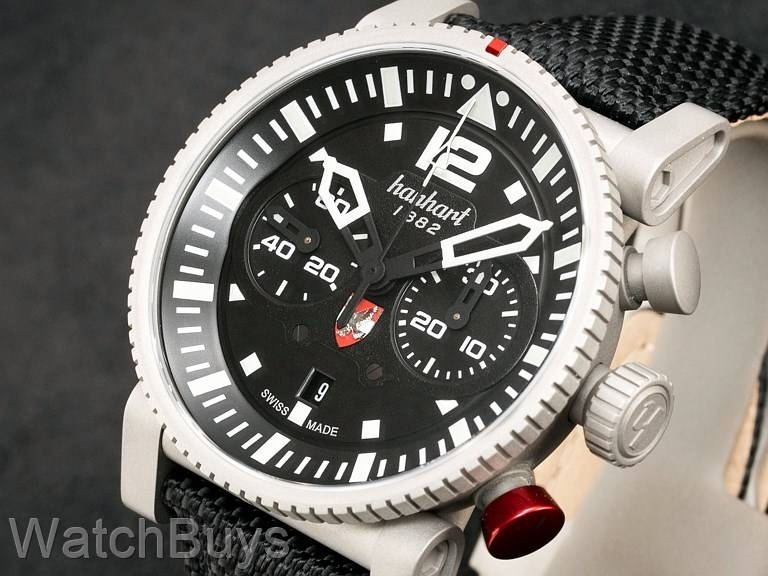 We've upgraded the strap and buckle on this watch to the best Hanhart offers. The strap is their performance series black textile strap which leaves no gap between the strap and the edge of the case. This watch also features the Hanhart folding deployant buckle which has been bead blasted to match the case finish and features a red inline design to match the bezel and pusher. This is the highest quality deployant buckle we have ever seen on a watch and extremely comfortable to wear.